This light, delicious and highly refreshing organic tea is made from the buds and young leaves of the tea bush. 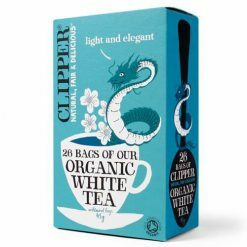 It is sourced from the Fujian Province in south east China, the traditional home of white tea, which is symbolised by the lovely dragon on this pack. White tea has a very refined and subtle, but deliciously rounded, flavour. Young leaf buds are gently oxidised to create a clean and healthy drink that is a powerful source of natural antioxidants. In 1994, Clipper Tea became the UKEEs first “pany. The products contain no artificial ingredients and each teabag is unbleached, as nature intended. Many products are also naturally caffeine-free or, in the case of Assam Blend, caffeineless, having undergone a non-chemical decaffeination using carbon dioxide.